“Due Date” star Robert Downey Jr. would like to address two of the comedy’s biggest hate-yourself-for-laughing moments. Okay, all good? No need to show your ticket stub. So how did Hollywood’s current reigning king-of-all-comebacks, who after a checkered personal history has basked in the beloved embrace of audiences for the past few years, feel about punching a child in the stomach and spitting in a dog’s face on screen? 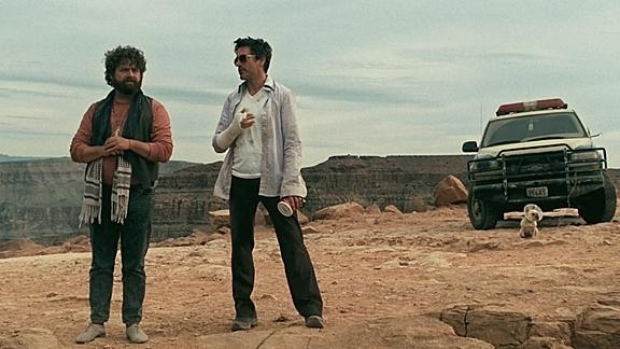 Downey said he reveled in unleashing his character’s tightly coiled just-under-the-surface rage whenever provoked by co-star Zach Galifianakis’ character. The actor enjoyed it so much he’d be game for a sequel, even though he’s already juggling “Iron Man” and “Sherlock Holmes” commitments. Speaking of those franchises, Downey's already at work on the “Sherlock” sequel: “Sequels are always tough, but we have a great group. We're three weeks in and it's already pretty fantastic,” he said.